Winter again. Winter in Hawaii means humpback whales, bright blue clear skies all day and baby dolphins learning to spin! Yes, the Humpback Whales are home for the winter. They arrived in October and we frequently saw them in December. This is early for the humpback whales in Kona. They greet us with abundance for the holiday season; a special treat to have lots of whale sightings to celebrate with the New Year. They come home to Kona to breed and give birth. The Humpbacks sing new songs each breeding season, yet how all whales sing the same new song each year is a mystery. The songs are amazing. They are highly structured, and, at any time, all the males in the population sing the same song using the same sounds arranged in the same pattern. The humpback whale ‘song’ has been heard by sailors for centuries. 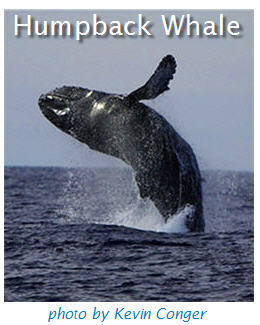 The first known recordings of humpback songs were made, via U.S. Navy ships, in the late 1950s off Hawaii and Bermuda. Scientists first recognized these sounds as coming from humpback whales in the 1960s, and the first technical description of humpback whale song was published in Science in 1971 by Dr. Roger Payne and Scott McVay. We know that the males produce the long songs, ranging from 5-30 minutes. The length of the song appears to depend on the age of the whale. The song develops in complexity as the whale develops. Young whales start with one theme and will increase to 5-7 themes. (As a point of reference, only 3-4 themes are used in classical music!) You can hear songs repeated again and again for up to three hours. The males sing mainly during the breeding season, so the song is probably related to mating. It is not known whether the songs are used mainly to attract females, to threaten other males, or to celebrate breeding success. Whale songs differ from population to population – the humpback whales of the North Pacific (Hawaii, Mexico, Japan) have different songs than, for example, the humpback whales of the South Pacific. Perhaps these are different dialects? The humpback whale song is one of the most complex, non-human, acoustic displays in the animal kingdom. It is amazing to hear. Yesterday we were out about 2 miles from Kua Bay. For about 20 minutes we watched a baby a few days old, with Mom. The baby was doing baby breaches; so cute and precious. Joining them were 3 rambunctious young adults in a heat run. They were very entertaining. Finally, I believe, a male scored. Mom and baby veer off to the west, and a solo whale dove. The 2 whales were frolicking with white water and splashing galore. We headed out and away. Moving to a safe distance away, we wanted to hear the song “live”. We all slipped in the water and listened to the whale song. Oh so moving: Listen to the heart song. It is one of the most moving experiences on this planet. The song travels great distances. It sounded like the singing male whale was nearby, however in reality the whale we heard singing could have been a few miles away. Join us at Dolphin Journeys on a whale watch and enjoy these magnificent wise mammals. We offer whale watch – dolphin excursions and whale watch – manta snorkel combination trips this year, as well as our regular dolphin excursions, whale watches and manta ray evenings. The combo trips are intended to enhance your dolphin encounter and enjoy a leisurely whale watch, or spend the afternoon with the whales before an evening with manta rays. It is all breath taking!Join us on one of our amazing whale excursions! Dolphins! The dolphins are wonderful as always. They joyfully share the waters with their whale cousins for the winter. They send there love and blessings to all for the new year. Dolphin Journeys is blessed to have fabulous staff. We have added new positions and things seem to be humming along. If you have called this year, Jeanie or Sandy answered the phone. This year our dedicated staff is making the business at Dolphin Journeys happen smoothly and skillfully. 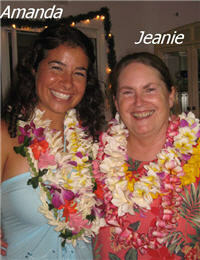 Jeanie is managing the office, keeping Captain Nancy at the helm of Dolphin TLC. She has brought her years of experience and happy nature to the position of Administrative Wizard. Many of you have enjoyed the friendly voice who greets you on the phone. Sandy, crewed on the boat Nov. 2006- Sept. 2007, and is now waiting to give birth any day. When she no longer could navigate the boat due to the expanding belly, she moved into the office to help Jeanie with the clerical stuff. We are all excited to meet the new baby who swam with dolphins from conception until 5 months in womb. Sandy misses the boat and is very excited to be a Mom. Karen is still around; for those of you who remember Karen as Nancy,s right hand gal in the office. She now volunteers her time in the Dolphin Office and works on the boat with our large groups. We have a part time permanent Captain, Capt. Jay at the helm of the Dolphin TLC 3 days a week. He is very well versed in the biodiversity of the ocean and Kona Coast. You will enjoy his wealth of knowledge and quiet demeanor. Nancy now has a couple of days in the office and a day off to relax, have fun and catch up. After 11 years, on 95% of all Dolphin Journeys, it is time. This also gives us easy expansion for days when we have large groups. The Dolphin TLC can still take the intimate 6 passengers and we can serve our retreat groups and corporate clients simultaneously. A wonderful woman, Robin, has joined as crew. She moved to Hawaii to be near her daughter who is about to give birth to her first grandchild. 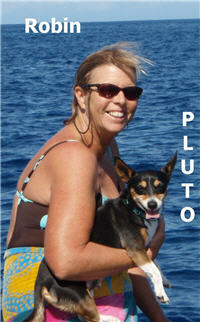 Robin has years of experience boating and is loving her days on the water. She has a background in veterinary medicine. After many delightful 20 something’s who usually crew, it is a pleasure having the grace and maturity of a confident woman! Robin has a keen desire for all our guests to have the best possible experiences. Our summer intern, Amanda, has gone home to North Carolina. She graduated mid-December at University of North Carolina Wilmington. She completed her 12 week internship program at Dolphin Journeys and thus finished the course work for her Parks and Recreation Major. We have a new apprentice, Amanda B. She has stepped off a cruise ship a month ago and came aboard the Dolphin TLC to learn seamanship. She is on sabbatical from her studies. She is eagerly working the program and asking for more sophisticated nautical training. I love it! We are including a testing process with the performance based evaluation of the students. Sorry interns, future interns will be tested on their knowledge of marine mammals and nautical data along with the bi-monthly reports and mid and final evaluations. Do they pay attention to Nancy’s Dolphin briefings? Do they remember the nautical terms when Nancy works with them on the boat? New applicants are welcome … if you have a young adult interested in our intern program, visit our Internship page online for information and an application. 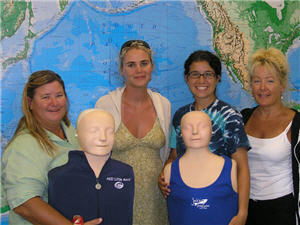 Dolphin Journey crew and friends at the Primary First Responder & CPR course: we keep our first aid skills up to par. Dolphin TLC has emergency oxygen on board along with complete first aid supplies. Although we hope to never need this equipment or these skills, we are prepared. We at Dolphin Journeys look forward to a fabulous year of dolphins, whales, manta rays and, most especially, we want to share our adventures with you!